Heronetta is right on Sandy Lane Beach - one of the island’s most beautiful! The villa has its own tennis court and swimming pool, along with a full staff, WiFi, and a great library. Heronetta is also located minutes from local shopping, restaurants, and water sports. What more could you want? Luxury in every aspect, very private! 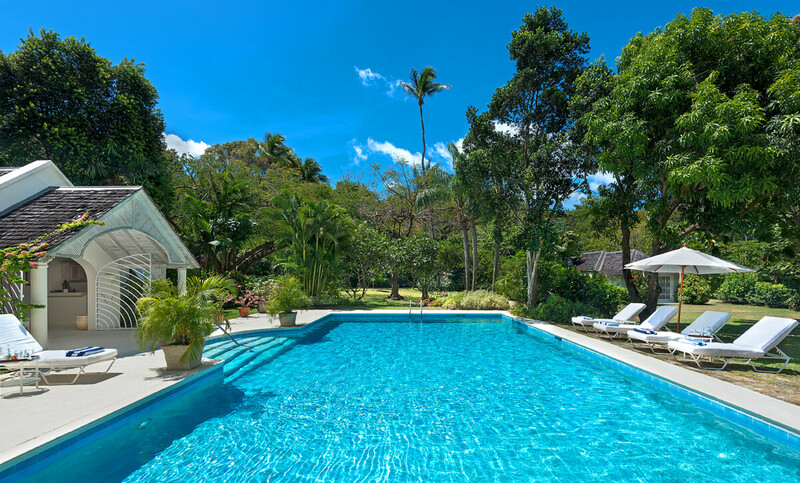 Heronetta Villa sits directly between Sandy Lane and Paynes Bay Beach, surrounded by four acres of manicured gardens. This villa is well-staffed with a housekeeper, cook, maid, laundress, security guards, and gardener. Luxurious outdoor amenities include a massive swimming pool, shaded loungers, a dining courtyard, a palatial dining veranda, and a nightlit tennis court. Heronetta offers direct access to Sandy Lane Beach and a private oceanfront cabana. The interior is just as elegant, with a spacious sitting room, WiFi, and multiple dining alcoves. The study is equipped for comfort, with a large library, flatscreen TV, and a wireless printer. Expansive countertops and commercial-grade appliances take the kitchen to the next level, and there’s a BBQ grill for al fresco feasts. Each of the five bedrooms offer air-conditioning and ensuite bathrooms. Two of the bedrooms are in the main house and the other three are positioned in cottages nearby. The main house’s bedrooms include a king suite and a twin suite with beds that can be converted into a king. Two of the cottages offer queen suites, and the third offers a twin suite with beds that can be converted into a king. Heronetta Villa is a five-minute drive from the Sandy Lane Golf Course and a little further from the Royal Westmoreland and Apes Hill courses. There are several restaurants up and down the coast, and the farmer’s market is a few minutes away. A great vacation from beginning to end! Five of us stayed in the villa, but with the villa’s 5 bedrooms and ensuite bathrooms, it could easily and comfortably accommodate 10 guests. The villa is beautiful and the photos accurately show its opulence, size, and comfort. The staff, which consists of a villa manager, cook, laundress, cleaners/servers, gardeners, and security, are all lovely. There is a great deal of room within the gated confines of Heronetta, so it’s very easy to find alone time, no matter how large your party is. We loved our stay, and can’t imagine staying anywhere else on the island. Working with WhereToStay.com and Andrew in particular was painless and a joy. Communication was great, and any questions I had were answered in less than 24 hours. I was very impressed and would use this site again.